“Psychotherapy” literally means care of the soul. It is about healing, returning to a previous healthy state, and as a result, being made whole again. In our age, the process of healing is most often described and studied scientifically. A disease is defined and then correspondingly its recommended cure is suggested. The healer’s role is to diagnose the syndrome and administer the prescribed treatment. The uniformity and predictability of this approach to healing the body can account for its almost universal acceptance as well as its significant influence on numerous areas of soul healing. Beth Hesda means House of Grace in Hebrew. “Bethesda” in turn became associated with healing and can be found in the title of many medical institutions. Jesus knows what is “wrong” with the man but he does not dwell upon it. His first interaction is future oriented: “will you be made whole?” he asks, pointing the man towards a possible recovery. Similar to using the now classic miracle-question (Solution Focused Therapy) he changes the frame of reference and guides the client toward an active inquiry regarding a possible healthy state. This is clearly a new orientation for the man. The man however responds with his symptoms: his learned helplessness, his bad luck, and his expectation for some magical cure originating from outside of himself. Jesus simply tells him to act. In fact, all you truly need is to change your relationship to your life and to your suffering, and to make an intentional step toward these possibilities. I doubt that as a therapist I can tell my clients to “pick up their bed and walk”. If I did so, they would most likely consider me insensitive or even arrogant. They very likely would feel unheard and perhaps even judged. It’s feasible that the client will have understood me to have said: “It is all in your head”. As a sensitive clinician surely knows, if told insensitively what’s wrong with him or herself and abrasively how to fix it, clients are likely to feel shame. As a result, they will either seek another therapist, or sink more deeply into whatever ails them. As often happens in persisting conditions, the sickness becomes part of the person’s sense of identity, and in such instances it cannot be removed without hurting the person’s very core. So what is it that Jesus does differently? How can he manage with saying something like, “Take up thy bed…”, and even bring about complete healing? He sets the stage by connecting through an open and curious question, and also explores the possibility of healing both inside himself and inside the man. It is possible that a long time could have passed between the initial interaction and the final cure, and this duration would surely have contributed to building the therapeutic relationship. That said, it could also be brief. For instance, in a state of trance, and with the full trust of the client in the healer and also the full trust of the healer in a greater power, things can happen very fast. If this the case, the healer then reaches directly into the deepest layers of the client and of the greater field, and in turn connects directly with the core issue. When this is the case, he is able to turn things around in a single phrase by inviting the man into a new and healthy identity. The actual symptoms are described as impotence, infirmary and in some translations bone sickness. What we know is that the person is confined to his bed and that he “has no man”, his masculine side is underdeveloped. He needs external crutches to face the world, both physically and emotionally. He certainly cannot “walk on water” as Jesus demonstrates elsewhere. To do such a thing, one needs an independent and strong heart as well as a clear mind that is not easily thrown off course by the unconscious. The phrase “Take up thy bed” connects the sick person with the long forgotten masculine part deep inside himself, the part of himself that can set a healthy boundary and act intentionally. Pathologizing forces the soul to a consciousness of itself as different from the ego and its life–a consciousness that obeys its own laws of metaphorical enactment in intimate relation with death. The healing is not the removal of symptoms. Rather, healing involves finding individual meaning and deep soul expression in the disease. The cure is in the sickness, which is symbolized in this story by the bed. This type of healing touches the sacred, and thus the various references to the Sabbath, which represents the spirit and that which is sanctified, separate from daily life. The man was sick for thirty-eight years. In Hebrew numerology thirty-eight is the word “Chol”, which means “sand” and also refers to that which is non-sacred. “Chol” is also the term used for weekdays, for days that are not the Sabbath. Hence, the man was looking for recovery in the wrong place. The moment he can recognize the sacred he is healed. I am not involved in organized religion, and I assume the possibility that many readers are similarly non-religious. Some might even have a negative reaction to biblical stories, especially if they have come to be associated with their oft cheap usage in preaching and proselytizing. So what can we learn from a story which is rooted in a culture and worldviews very far from our own, both in time and in place? As a healer I am inspired to keep looking beyond the story, beyond the wound and into that part which was never wounded. I am also reminded by this story to consider the disease and the symptoms as genuine expressions of the soul’s deepest desire to manifest and grow. Such a story brings me to the symbolic and mythical layer of communication, over which, the literal is only a thin veneer. As a person seeking healing, I am reminded by the story to look for a healer who can see into my soul, and in the right moment say: “Rise, take up thy bed, and walk”. I look for a mirror that can reflect back to me my possibilities and wholeness, a person who can see that which I forgot, and can in turn inspire me to go beyond the mundane facts. I seek a good neighbor who can carry my hope when I am unable to carry it for myself, a healer who can see my potential and not only my pain. Reading about this miracle, I am reminded of another story from Milton Erickson, who is also a great mythical healer. Similar to the Bethesda story, Erickson points out that the very brief therapy consisted only of changing relationship to one’s identity and creating hope through empowerment. 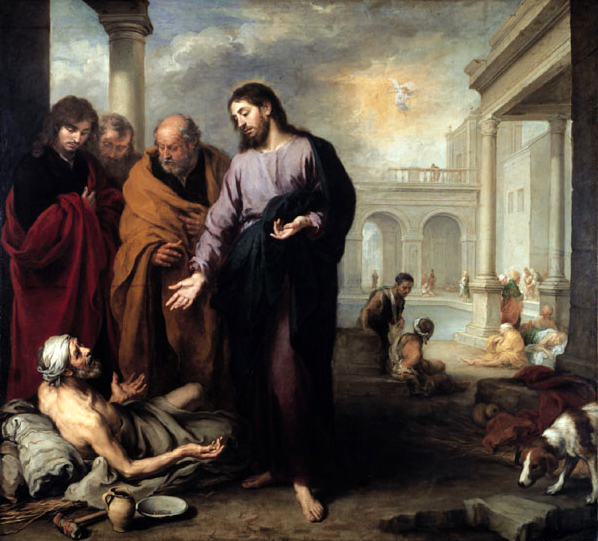 This biblical story is depicted in a painting by Murillo showing deep understanding of the story and adds commentary on another dimension. Jesus stands in the middle between the sick man and the Holy Spirit, able to be human and more at the same time. In the background we see another sick person who does have a man to carry him into the water. Yet, his life remains in the pool of Bethesda and his identity remains attached to disease.